The 2018 AALS Conference on Clinical Legal Education, held in Chicago, IL, from April 29th to May 2nd, provided, according to Professor Carol Suzuki, "An opportunity for me to share with legal clinicians around the country the collaborative work that some students in the UNM Clinical Law Program engage in to promote healthier brain development and physical and mental wellbeing in babies whose mothers are incarcerated." 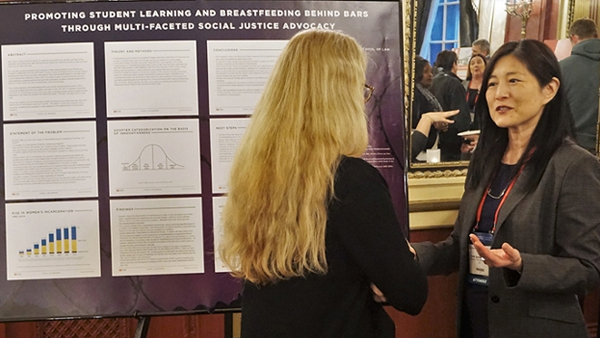 Students enrolled in the University of New Mexico School of Law Clinical Law Programs worked in collaboration with other advocates and the local county jail (MDC) administration to develop a breastmilk expression policy that was adopted by MDC to assist pregnant and lactating inmates and their babies. A policy that supports the mother/child bond may promote child health and wellness, address adverse childhood events, and reduce recidivism. Using the theory of Diffusion of Innovations, the poster examined clinical law programs as innovators and early adopters of strategies to promote social justice and to teach transferable skills that meet student learning outcomes. As part of their hands-on clinical training in community-centric lawyering, UNM Law students worked on the Bernalillo County, New Mexico, Metropolitan Detention Center’s “Breast Milk Expression and Storage Policy,” assisting in developing and establishing a procedure whereby lactating inmates may breastfeed their babies during visitation and express breastmilk for their infants in order to maintain breastmilk supply, and safely provide breastmilk for their infants. The project provided clinical law students with opportunities to work on facets of a number of the law school’s Student Learning Outcomes (SLOs), including learning professional skills needed for competent participation as a member of the legal profession, such as the ability to collaborate effectively; conducting themselves ethically and with professionalism through community involvement and understanding the responsibility to promote justice; and analyzing problems to develop potential solutions and strategies for resolving them. Professor Carol Suzuki is the author of numerous publications and articles including, Issues in Family Law for People with HIV, in AIDS and the Law (4th ed. Supp. 2014), co-author with Scott Skinner-Thompson, Family Court Proceedings, in the American Bar Association's HIV & AIDS Benchbook, co-author with Toni Holness and Carolyn McAllaster (2d ed. 2012), Death with Dignity and Advance Directives in the United States, 1 JACE Newsletter 1 (Japan Association for Clinical Ethics) (Sept. 2013), "How Law Schools in the United States Are Responding to Decreasing Applications and Job Prospects," 47 Comparative L. Rev. 123 (2014), When Something Is Not Quite Right: Considerations for Advising a Client to Seek Mental Health Treatment, 6 Hastings Race & Poverty L.J. 209 (2009), Unpacking Pandora’s Box: Innovative Techniques for Effectively Counseling Asylum Applicants Suffering From Post-Traumatic Stress Disorder, 4 Hastings Race & Poverty L.J. 235 (2007), and more. The AALS Conference on Clinical Legal Education is held annually as part of AALS’ mission to uphold and advance excellence in legal education. AALS promotes the core values of excellence in teaching and scholarship, academic freedom, and diversity, including diversity of backgrounds and viewpoints, while seeking to improve the legal profession. For more information on Professor Carol Suzuki, please see her online profile. For more information on The Association of American Law Schools (AALS), please visit their website.